A Torvaldine was spelled with both a "T" and a "TH" depending on the date of the record. Early documents were spelled Torvaldine, but as the 1900's approached the convention changed and T's became Th's and Thorvaldine... The same for Thorvald too. 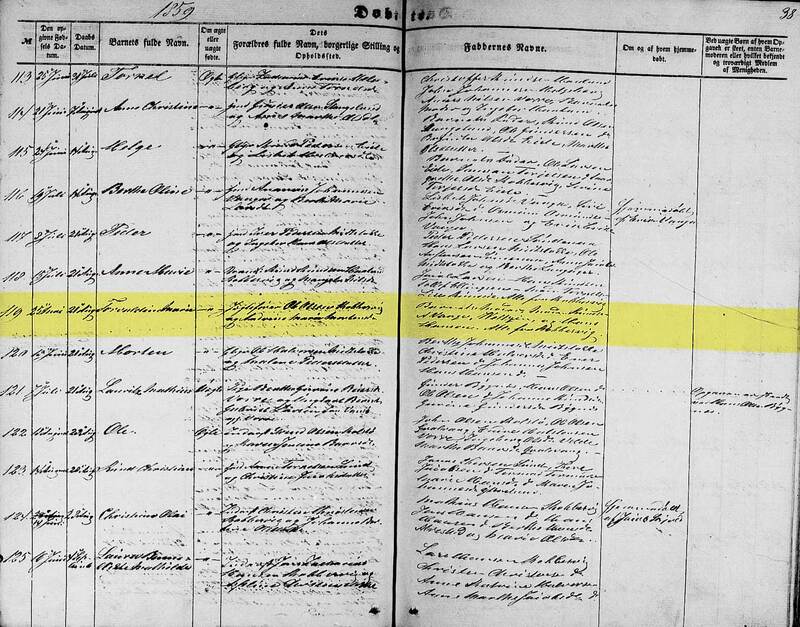 1 Norway Parish Registers, Baptism Records about Torvaldine Marie Olsdatter; The National Archives of Norway: The Digital Archives; Oslo, Norway; (http://www.arkivverket.no/URN:kb_read?idx_kildeid=1581&idx_id=1581&uid=ny&idx_side=-35); Visited:13 Jan 2014 ; Rogaland county, Avaldsnes in Avaldsnes, Parish register (official) nr. 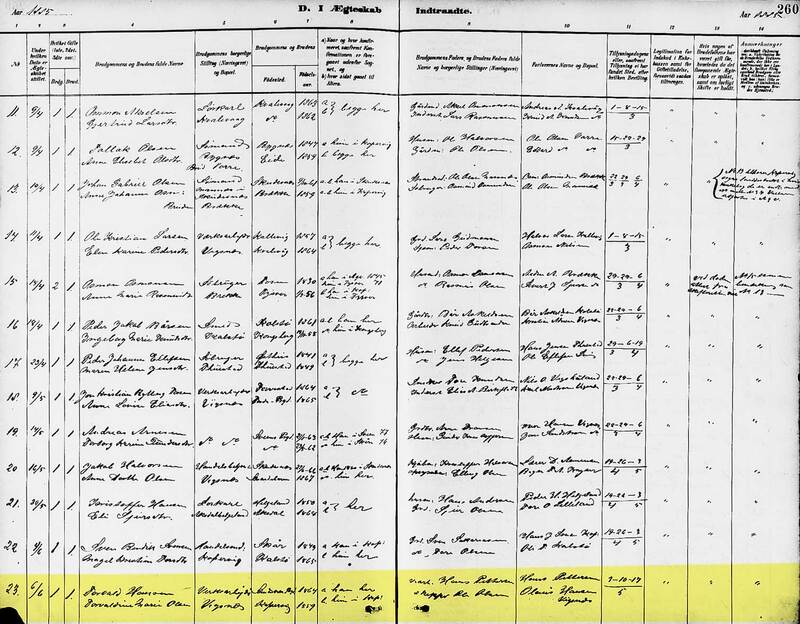 A 10 (1857-1876), Birth and baptism records 1859, page 29; Entry No. : 119. 2 Norway Parish Registers, Death & Burial Records about Ole Olsen Kopervik; The National Archives of Norway: The Digital Archives; Oslo, Norway; (http://www.arkivverket.no/URN:kb_read?idx_kildeid=6296&idx_id=6296&uid=ny&idx_side=-175); Visited:13 Jan 2014 ; Rogaland county, Kopervik in Avaldsnes, Parish register (official) nr. A 11 (1861-1880), Death and burial records 1861-1863, page 210; Entry No. : 7. 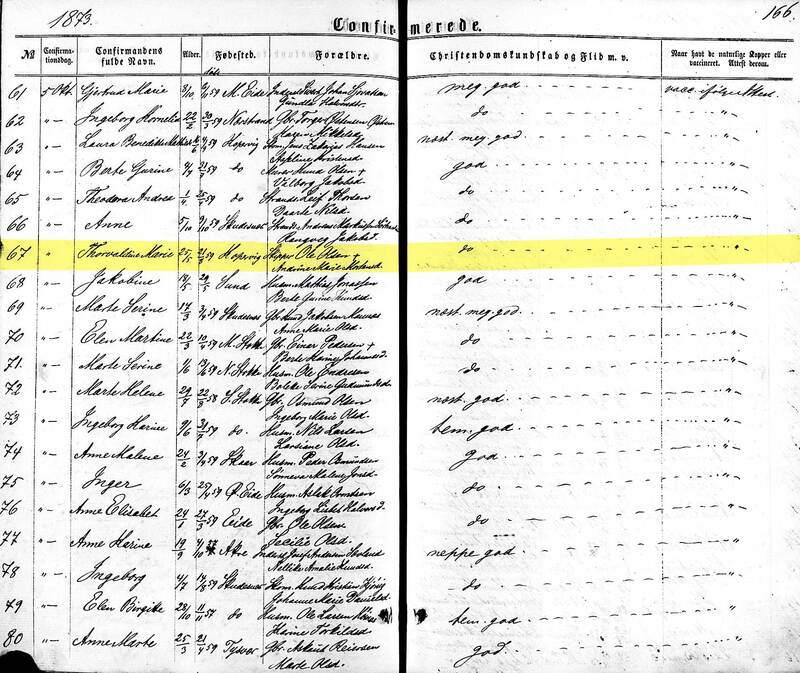 3 1865 Norway Census about Torvaldine Olsdatter; The National Archives of Norway: The Digital Archives (Digitalarkivet); Oslo, Norway; (http://digitalarkivet.no/cgi-win/WebCens.exe?slag=visbase&sidenr=2&filnamn=f61147&gardpostnr=185&personpostnr=1144&merk=1144#ovre); Visited:13 Jan 2014 ; Rogaland county, Kobbervig; Census of 1147 Avaldsnæs; Entry No. : 1141-1146; Family No. : 185. 4 Confirmation of Torvaldine Olsdatter, 1873; The National Archives of Norway: The Digital Archives (Digitalarkivet); Oslo, Norway; ( http://www.arkivverket.no/URN:kb_read?idx_kildeid=6296&idx_id=6296&uid=ny&idx_side=-143); Visited:22 May 2014 ; Rogaland county, Kopervik in Avaldsnes, Parish register (official) nr. A 11 (1861-1880), Confirmation records 1873, page 166; Entry No. : 67. 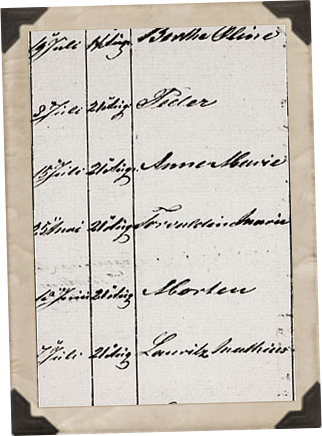 5 Norway Parish Registers, Marriage Records about Torvald Hansen and Torvaldine Olsdatter; The National Archives of Norway: The Digital Archives; Oslo, Norway; (http://www.arkivverket.no/URN:kb_read?idx_kildeid=6254&idx_id=6254&uid=ny&idx_side=-126); Visited:31 Jan 2014 ; Rogaland county, Avaldsnes in Avaldsnes, Parish register (official) nr. A 15 (1880-1906), Marriage records 1885, page 170; Entry No. : 23. 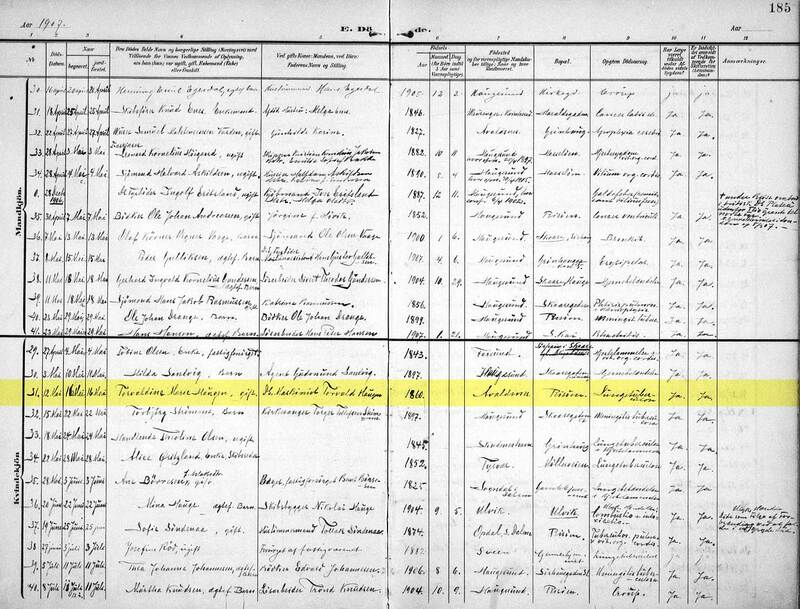 6 1900 Norway Census about Thorvald Haugen; The National Archives of Norway: The Digital Archives (Digitalarkivet); Oslo, Norway; (http://digitalarkivet.no/cgi-win/WebCens.exe?slag=visbase&sidenr=1&filnamn=f01106&gardpostnr=337&personpostnr=4391&merk=4391#ovre); Visited:13 Jan 2014 ; Rogaland county, Haugesund; Census of 1106 Haugesund; Sørhauggade 121b; Entry No. : 4391-4397; Family No. : 337. 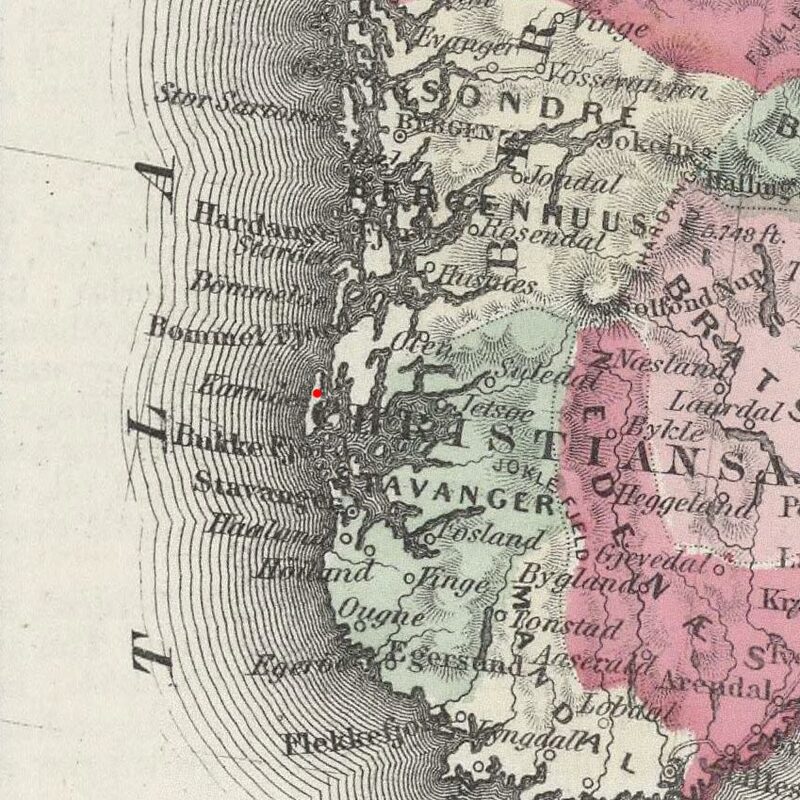 7 Norway Parish Registers, Death & Burial Records about Torvaldine Marie Haugen; The National Archives of Norway: The Digital Archives; Oslo, Norway; (http://www.arkivverket.no/URN:kb_read?idx_kildeid=1768&idx_id=1768&uid=ny&idx_side=-175); Visited:31 Jan 2014 ; Rogaland county, Haugesund in Haugesund, Parish register (official) nr. A 7 (1904-1916), Death and burial records 1907, page 185; Entry No. : 31.